At Precision Home Services, it is our mission to ensure that your family can breathe easy with clean air flowing through your heating and cooling system! That’s why we are offering this air duct cleaning coupon to homeowners throughout the Southeast Michigan region. Dirty air ducts can contribute to health issues and cause problems for people with allergies, respiratory health conditions and autoimmune disorders. Avoid these types of issues and redeem this special offer to clean your ducts today! 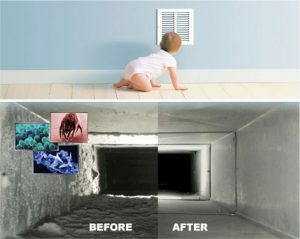 Eliminate years of dust, dander and dirt that has accumulated in the ducts of your HVAC system. Use the form at the bottom of this page and schedule a free estimate. Birmingham, Rochester, Oakland Township, Northville, Canton, Farmington Hills, Ann Arbor, and Richmond – we serve the entire Southeast Michigan region. 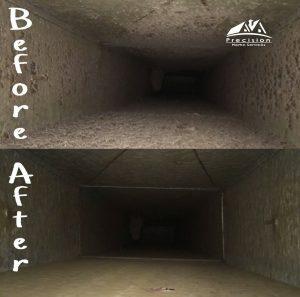 Our duct cleaning professionals will ensure that your ducts are clean as they can be with our specialized techniques and equipment. Our duct cleaning service improves your indoor air quality and provides a healthier living environment for you and your family. Don’t pass on this offer – schedule today! To redeem this special offer, just mention coupon code CleanAir2018 at the time of booking! Fill out the form below and a home services representative will get back to you ASAP to schedule your appointment. What are the Benefits of Air Duct Cleaning?